"Do not fear what may happen tomorrow. The same loving Father who cares for you today will care for you tomorrow and everyday. 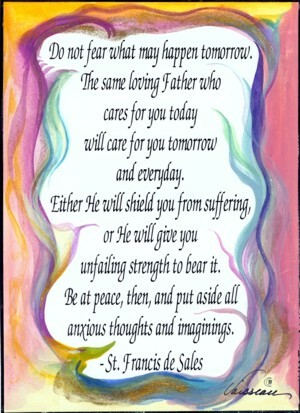 Either He will shield you from suffering, or He will give you unfailing strength to bear it. Be at peace, then, and put aside all anxious thoughts and imaginings."